We have wild grapes growing in the backyard, and when I was doing some internet research to figure out what kind they were and if they would be delicious, I figured out that grapes have grape leaves. DUH! 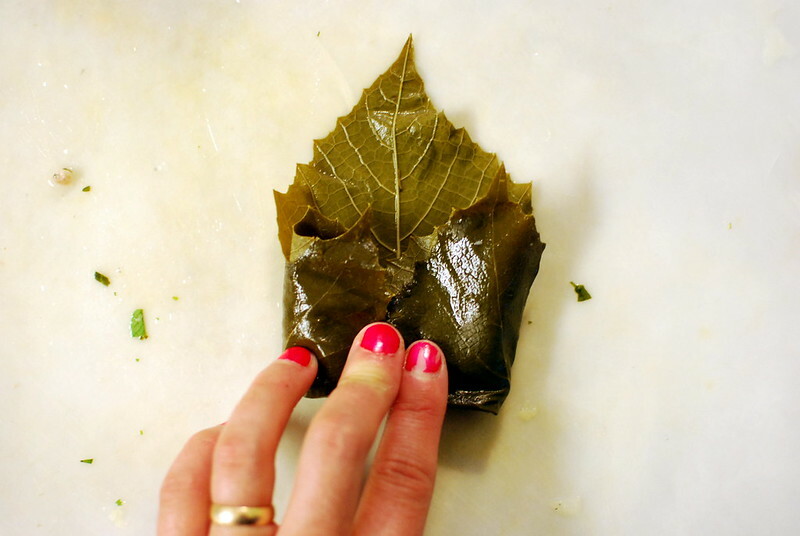 What do you use grape leaves for? Stuffed grape leaves! Good idea, internet! So I rushed out to the yard and picked a whole bunch, then tossed together some rice and stuff, blanched the leaves to soften them up, rolled them up, and cooked them off. YUM. Bring a pot with a few inches of water to a boil. Drop the leaves in a small bunch at a time (about 10) and swirl around for about a minute. Pull them out and rinse under cold water, repeating until all leaves are blanched. Now slice off the stems. Combine rice, sausage, diced onion, pepper, garlic, lemon juice, mint, and salt and pepper. Line the bottom of a dutch oven with a few layers of leaves, place the rounds of onion in the bottom of the pan. 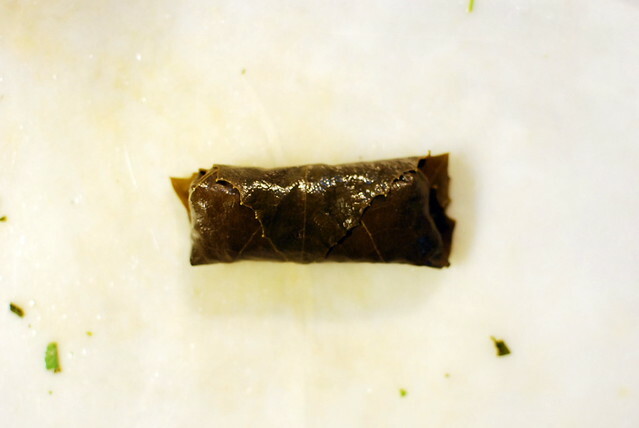 Now, roll the dolmas. Lay the first leaf shiny side down and place a heaping tablespoon of filling in the middle. Fold up from the bottom, fold the sides over, then roll. Don't make them super tight because the rice will expand with cooking. Place the first roll seam side down and repeat with the leaves until the filling is gone. Cover with more leaves, then pour in about a cup and a half of water and bring to a light boil. Turn the heat down to medium-low, cover loosely, and cook until rice is done. Depending on what kind of rice you use, this can take up to an hour and a half. Cut one in half to check for done-ness. Serve hot, or straight from the fridge with some sort of yogurt sauce. 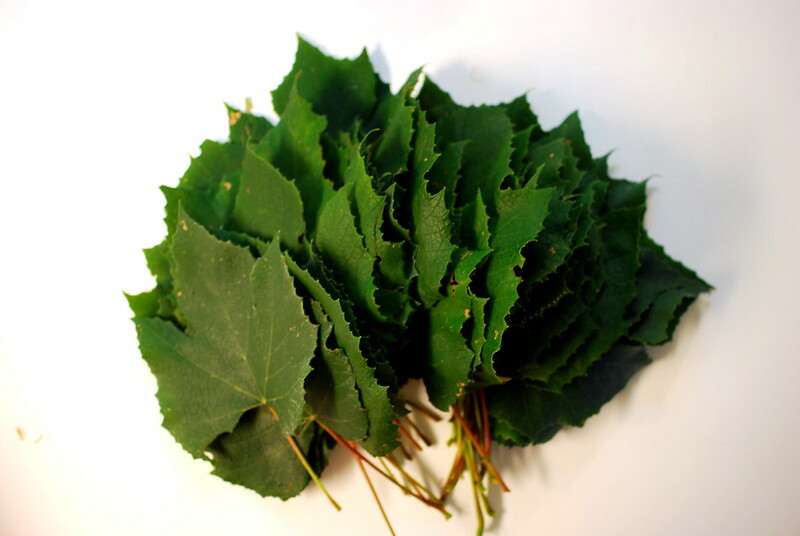 I am amazed...a long time grape leaves fanatic, I have always only known them to be made with leaves in brine. And they are salty because of that.